I'm on a small vacation in sunny south Florida and reading the book Free Capital: How 12 private investors made millions in the stock market which is mainly about 12 British investors who have made millions in UK small caps. The book is good, it's a nice light read which is perfect for the pool and beach. I've been squeezing in a chapter here and there between playing in the waves with my son. In the spirit of the book I decided to do a post on a UK small cap. Argo Group is an investment management company that runs five emerging market funds. The company is headquarters in Isle of Man but claims its main place of business is Cyprus. The funds the company runs are headquartered in a variety of countries ranging from Cyprus, Romania, and Singapore to the UK. The company is listed in the AIM yet uses the US Dollar as its functional currency even though it has no operations or tie to the US. The company has been managing funds since the year 2000 and has 26 employees. Argo Fund - A fixed income fund that invests in corporate and sovereign debt in addition to currencies. This fund is quoted on the Irish exchange and was founded in Oct 2000. Global Special Situations Fund - Deals in distressed credits and special situations across all levels of the capital structure. Capital Partners Fund - A closed-end fund founded in 2006 which aims to invest with a two to three year time horizon. The fund invests in stocks, bonds, PIK loans, warrants, convertibles and shareholder loans. Real Estate Opportunities Fund - A fund quoted on the AIM (AREOF) committed to property investments in Romania, Moldova and Ukraine. Distressed Credit Fund - A bottom up distressed credit fund founded in 2008. The company is a spinoff from Absolute Capital Management (ACMH) and was party to a lawsuit from before the spinoff. It seems that the legal dispute was a very big weight on the shares, the case was dismissed a few months back. -Fundholder lawsuit was dismissed in June ending the legal liability overhang as well as ongoing litigation costs ($614k in 2010 and $866k in 2009). This is a pretty clear net-net investment, the company is trading at a discount to it's net cash position and in addition is showing a small profit and free cash flow. Here is my net-net worksheet, note the USD/Pound conversion. The company seems to be doing a lot of things right in the absence of dynamic growth, they are returning cash to shareholders by paying out a generous dividend in addition to buying back shares. While profitability and revenue have been declining for the past few years the company still sports impressive margins. I think there are a few things working against Argo that are causing the shares to trade below NCAV. -Argo was a spinoff which usually face indiscriminate selling and a short operating history. -There was a lawsuit which was proving to be a slow cash drain, and had the possibility to threaten the business. -The company is generally misunderstood, it's traded in the UK yet is based in Cyprus and uses the USD as its functional and presentation currency. A cursory look via FT.com will give incorrect values. I don't own any shares of Argo yet, but I'm strongly considering adding them to my net-net portfolio. Just a small warning, the company is small with an average trading volume of £8k and appears to be pretty volatile in trading. Disclosure: No position in Argo, I am doing further research and might initiate one at any time. A net-net in an industry known for its operating leverage. What is thier fee structure? The fee structure is a classic hedge fund 2-20. Currently none of the funds are above their highwater mark so revenue and profits are just the straight 2%. If you look at the filing papers with the 2008 and 2007 revenue/profit numbers it gives a good approximation of the earning potential once Argo is able to take 20% again. Seems like they need to spend a bit on marketing the funds which will hit operating profit margins initially as well as grow organically by capital appreciation. If they can double AUM, it sounds like a value net-net story turns into a growth story with serious operating leverage and margin expansion. Anyway, buying under liquidation value seems like a no brainer, thanks for bringing it to my attention. How in the world did you find this one? This is pretty brilliant, btw. It's market cap is so small that only small fries like us are willing to bother with it. I was running some screens on screener.co a few months back and stumbled across Argo, a rare find indeed. It's the type of stock I like, small, a bit of mystery to it yet selling at an insane discount. Is there any way to find out the intrinsic value of the assets these funds hold? While the statements how the fair value of the shares of the funds the company owns, it doesn't say anything about the holdings themselves, specifically what portion of their holdings are cost and what part are unrealized gains. I want to find out what would happen to the "fair value" of the investments in the event that interest rates rise. I suppose all I can do in the meantime is discount those to 70% of book. The stock is still quite appealing on that basis. I was curious about that as well, I haven't been able to find out any details beyond how big the funds are currently which is in the report. I think part of the problem is a few of the funds are hedge funds which are famously opaque. I think your approach of discounting the funds to 70% is probably appropriate. 1) The company rises to NCAV which would be a nice solid increase on it's own. 2) The managed funds hit the high water mark and the 20% performance fee is earned giving an enormous boost to profits. I guess there is a third option which is AUM grows and the 2% fee increases, but for AUM to grow I think the funds need to perform well which should trigger #2. Nate, do you have an ideas as to how one would buy a stock like this on the LSE? There is of course the option of paying a hefty fee for a broker-assisted trade, but I'm kind of cheap. I don't see any options besides that currently, though. The brokerage IB can do it, but they require a history of 100 trades, which I don't have. I ended up purchasing shares, I use Fidelity as my broker and it cost me £9 plus stamp duty, so not terribly expensive. I did everyone online as well no need to call anyone. I know you can trade internationally in London with E*Trade, but I would call them and make sure Argo is available because it trades on the AIM. I believe IB also limits AIM trading. Just a note they say they require $1m in assets, I don't have that, but I called and asked if they could still upgrade my account and there weren't any problems. I believe NobleTrade also does AIM trading. Thanks a ton. I couldn't find anything anywhere. Looks like e-trade can do it for a cheap price. A friend of mine brought up an interesting point when I mentioned this to him. He mentioned that I should check to see if there is some kind of "management agreement" with the investors of the company's hedge funds, particularly the real estate fund. Sometimes there will be agreements that any decrease in the value of AUM will be taken out of the management's equity position before affecting the investors' positions. If the company has this kind of agreement, then the investment assets would be best marked down to 0% and all the value is gone. It doesn't seem to me that ARGO has this kind of agreement because their investment assets didn't get wiped out during the stock crash of 2008-2009. The decrease in the investment account was about 40%, same as the reported decrease in TAF. It just goes to show, though, there are all kinds of small factors that you have to be careful of and watch out for. Good point on the equity agreement, from what I can see that doesn't exist in Argo's case. What's fascinating to me is the ownership structure, it's two brothers that have owned this company since around 2000, it seems that the funds are separated enough that Argo basically collects the money and distributes it to the brothers without much liability attached, quite a nice arrangement. Excellent digging on this one, what's nice is that none of the documents are too long to read, and nothing is extremely opaque outside of the actual funds. I was able to get a quote on the Real Estate Fund, Bloomberg has it for .04 EUR a share, it looks like it hasn't traded in a while. I'd love to know the actual property bought in Moldova, Ukraine and Romania. Romania could actually be a hit, a friend's fiance is from there and he said the place is absolutely booming right now. He's been there a few times and said since the end of Communist rule it's been flourishing which is a good sign. Thanks for the heads up on E-TRADE. In today's world, it's amazing so few brokers can support intl trading. Just as a side note, the 20% is really just gravy if and when it kicks in. 2% mgt fee and trading under liquidation value gives you a pretty wide margin of safety. Like Nate says, if any of the eastern European economies kick in, this one could be a home run. The fixed cost nature of the asset management business allows for each incremental rise in AUM (and therefore revenues) to flow right to the bottom line (great operating leverage in the model). Good Luck. I'll be damned, the exchange rate between the pound and the dollar has wiped out 4% potential return since I first looked at this. I suspect this is related to the US debt stuff + the Euro debt stuff getting resolved. Ouch your right James, hadn't looked at a chart of that in a while. The good news is there is still plenty of upside left.. Does anybody have insight into their troubled Real Estate fund? They have serious cash flow issues and the auditor expect them to need new cash and equity after Q2 2011. They breached loan covenants in 2010 and have temporary covenant and amortization holidays. Any visibility as to how this will affect AGL? The fund's report state that AGL will defer its management fee ($2m, ~20% of their overall fees) as well as either support the fund with cash and equity or raise additional equity from third parties (if there is demand I suppose). I strongly recommend reading those docs as this situation may impact the NCAV and the use of their excess cash. I suspect that if the Romanian/Ukrainian economies and property markets deteriorate, AGL will face the choice to either let the lenders take possession of the properties or use several millions of its excess cash to stabilize the fund's cash flow. I like the company but this is a serious legacy issue (an Eastern European commercial RE fund set up in 2006 - the folly..). Thanks for the links to the Real Estate fund letters, fascinating reads. It seems like they have a few options, but one of them could materially change the amount of cash held at the parent level. I also noticed the shares for the fund are trading at .04 EUR/share, meaning it probably wouldn't take that much money to buy control of the fund and force a liquidation. As a side note the fund literature claims the NAV of the fund is .11 EUR vs a trading price of .04 EUR, not sure if any value actually exists in there. Thanks for the comment, did you post your comments over at iii.co.uk? If so I probably read it, I like to skim through things over there for UK stocks. I appreciate your insight into valuing asset management firms. Very interesting valuation method; percentage of AUM plus cash plus investments. It's really like a shorthand way of figuring out a return on AUM instead of looking at the return on the fixed asset base. I like the 35p target as well, let's hope they can get there! Are you invested in Argo as well? Hi, has anybody bought AGRO through a retail/discount broker? ETrade doesn't have a market maker for the AIM, Interactive Brokers says they don't trade AIM stocks either. 1) They raise third-party cash. Very positive. 2) They have to put in cash. Very negative. I would consider any investment in that fund as lost. 3) They start to liquidate some assets in order to satisfy the loans or lenders take possession. Either way, the company would lose $2m in annual management fees. The only other concern I have is regarding the special situations fund (AGSSF). As of Dec 31 2010, they still had a floodgate enacted and were experiencing redemptions. They actually put a lot of illiquid assets into that AGSSF Holding. I wonder if redemptions continue or if that situation is stabilizing. i thought advfn is a quote/price platform but does not offer actual trading? looks like they actually work with a bunch of retail/discount brokers (etrade and the likes). About buying, I bought through Fidelity, it cost me 9 pounds plus stamp tax so pretty cheap. I set a limit price and my order filled within a few minutes. advfn question, I've gone to the site a few times but it always redirects me to the US version, seems like some sort of autodetect based on internet location or something. Anyone know of a way to signup and read the UK boards from within the US? It is a standard practice to value a FM firm at a percentage of AUM. Just search AUM in VIC. It works like a deposit premium in the banking industry when a takeover occurs. Not an expert, but that is what I know. 2-20% is a pretty powerful model. I hope one day ARGO will pass it high watermark. Thanks for bringing this to us. Just wondering why you did not mention it at CornerofBRK. I am BaoXiaoDao on that site. Thanks for the verification on the valuation method. I am thinking I need to do a follow-up post on this, Argo generated a lot more interest than I could have ever imagined. I didn't post this on CornerOfBRK because at the time I wrote it I didn't quite know the gold mine I had hit. I read the filings and wrote this up while on vacation, then went back to relaxing without much thought, although I did end up picking up some shares. The comments on this one I think really have added value, and unearthed a lot more info that really made this post valuable. As a side note, I'm not always sure what to post over there, I don't want to cross post a lot of ideas, but at the same time I'm not always sure of my best ideas are at the time either. Did you ever buy a position in ARGO ? The stock goes ex-dividend soon for a 9% yield. 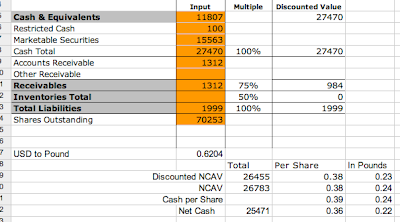 You can purchase the shares for around 14.35p ( inside the spread ) which will give a 9%+ yield. Also management has issued options that equate to around 8.75% of issued share capital. The exercise price of these options is 24p which suggests that management is somewhat confident of reaching that price and more. I don't mind if those options get exercised as there will be nearly 70% upside from here by the time that happens.....and that isn't including dividend payments. I did buy a position a few days after I did this post initially, and then I added to it a few months back. The dividend is nice while waiting for full value to be realized. Like you I think the options are pretty positive. I think there are some dynamics in place that might make it feasible for the management to take Argo private. The company used to be private, went public, was bought out, then spun out in a messy divorce. I think the founding brothers wouldn't mind controlling this privately again. What we really need right now is asset growth. The performance of the funds from last year was alright, but nothing ground breaking.